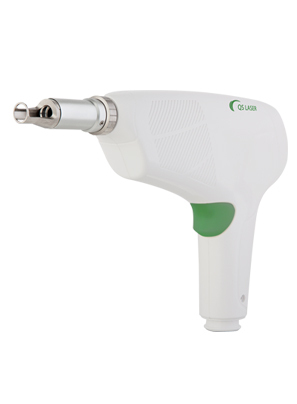 The Q Switched laser handpiece is used for removing tattoos of all colors, inks and depths. The handpiece is capable of emitting two wavelengths- 532 nm and 1064 nm, and you can easily exchange between them using the KTP adaptor. The handpiece comes with three spot sizes of 2, 4, 6 cm2. The software of the handpiece allows you to select the pulse energy output which ranges between 0.4-0.8 Joules/Pulse as well as the repetition rate between the pulses of 1,2 or 3. Treatment with the QS handpiece is effective all skin types I-V, and the handpiece itself has been designed for comfortable use and simple access to the different body areas.